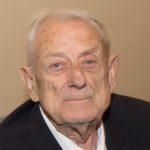 William Eugene “Bill” Frisbie passed away on Tuesday, July 31, 2018. Funeral: 2 p.m. Monday in Biggers Funeral Home Chapel, Private Interment at Laurel Land Memorial Park . Visitation: 3 to 5 p.m. Sunday at Biggers Funeral Home. Bill was born January 20, 1932, in Sayre, Oklahoma to the late Taylor and Gladys Frisbie. He was the oldest of five children. Bill graduated from Weatherford High School and continued his education at Texas Wesleyan University receiving a degree in Math and Education. Bill proudly served in the Army from 1954-1956. He spent his professional career at General Dynamics. He was involved in many areas at General Dynamics over the 42 years until his retirement from there. Most of his tenure at GD was spent in the Stress Analysis Lab and traveling to air force bases for flight tests, all over the world. Bill relocated after his first retirement to Haslet, Texas. He longed for a more rural lifestyle. The city of Haslet soon became his passion. He opened WEF Electronics shortly after he arrived. Not only did he own and operate WEF Electronics he also became heavily involved in the health and vitality of Haslet through the city government and other community endeavors. WEF Electronics closed upon Dad’s passing but his legacy in Haslet will continue. His family would like to thank all the citizens of Haslet who knew him. Also, we would like to thank his family of support at WEF Electronics. Bill was preceded in death by his parents and two sisters, Fern Hall and Louvenia Whitehead. He is survived by his daughter Sue(Don) Bierens, granddaughters Kim(David) Mattingly, Amanda Housley and Christina Housley, and by his brother Claude Frisbie and sister Terecia King, and longtime companion Evelyn Myers. In lieu of flowers, contributions can be made to the Scottish Rite Hospital at scottishritehospital.org. Bill always made us happy... God bless your testimony and the life you gave us as a Godly testimony. Bill was a respected strain gauge engineer and established many of the processes used in Flight Test Instrumentation. I’m sorry to hear of such a Legend’s death too late to attend his funeral. Bill was a big supporter of the library and was so kind to me when I worked there. Our deepest sympathies to Bill's family , he will be missed. Rest in peace Mr. Bill. Bill was one of the first faces that greeted me as I joined the Northwest Metroport Chamber 10 years ago. He was a joy to be around and I will miss his welcoming spirit dearly.